FAQ - Your body is not your currency. Dare to Be Bold. Your body is not your currency. Dare to Be Bold. I have registered my Be Bold girl but she can no longer make it, can I get a refund? Refunds are available less a 15% processing fee charge. Refunds will only be available until April 11 at midnight. Refunds requested afterApril 11 at midnight will not be honored. When I registered, I was not given the option to put in the name of my Be Bold girl, how can I make sure she is registered? Registration began with a technical difficulty that did not collect Be Bold girl names that has been fixed. Please email beboldlex@gmail.com with her name, T-shirt size and first and second track preferences, so that we can make sure we have her information. Registration closes on April 11 at midnight. Will there be registration on the day of on site? No. Registration ends on April 11 at midnight. How long do Be Bold girls need to attend? The entire day (9a – 5p). Registration opens at 8am. This is to ensure they stay focused and get the most benefit from activities. Early dismissal will be granted for emergencies only. Partial day participation is not allowed. What does my Be Bold girl need to bring? A Be Bold 2018 Permission Slip signed by a parent/guardian. Girls in the entrepreneurial track need to bring a change of clothes. Do parents need to stay with Be Bold girls the whole time? Parents are not expected to stay with their girls during the day, but there is a presentation at 4:15pm of what they learned on the day of the event for parents and community members. Can parents stay with Be Bold girls the whole time? Parents can observe but we do not have a budget to accommodate parent/guardian participation. 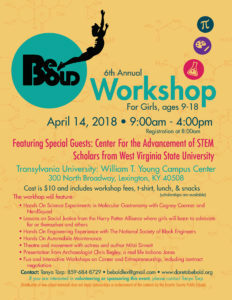 Parents would need to bring their own lunch, and snacks and t-shirts are only for the Be Bold girls. The focus of this event is on them and their participation but we welcome guardians in the room. When do parents need to pickup Be Bold girls? Parents are welcome at 4:15pm to the presentation (see above question) but pickup is at 5pm. © 2019 Your body is not your currency. Dare to Be Bold.. All rights reserved.